Welcome to the Jan Dempsey Community Arts Center! Your cultural community resource for creativity and education in the visual and performing arts. 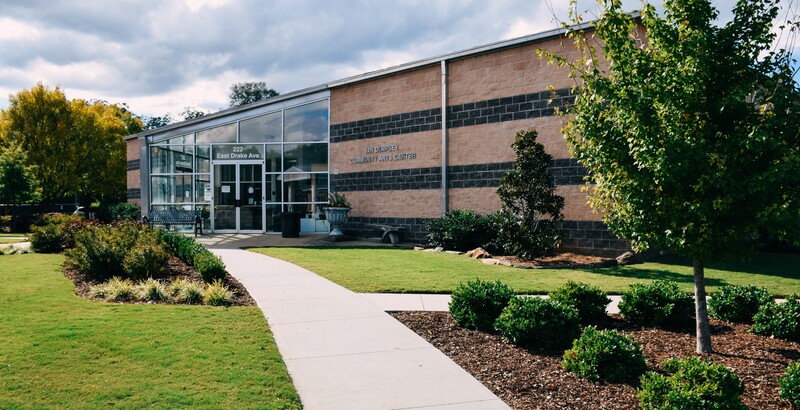 The Jan Dempsey Community Arts Center (JDCAC) offers many opportunities in the Auburn area to experience the visual and performing arts, entertain innovative ideas, develop new talent and experience everything cultural our community has to offer. There are classes and workshops for all ages, art exhibits in our gallery, community theatre performances, art education programs and special events held throughout the year that bring our cultural community together. In 1999, the JDCAC was constructed as a multi-use facility to better serve the artistic needs of our community and provide residents and visitors with cultural programming, as well art exhibitions, theatre productions, concerts, dance recitals, lectures and workshops and special events. The facility offers an art gallery, children's gallery, performance room, two art studios, and a conference room. The JDCAC is also available for rental and has been the site of many birthday celebrations, showers, workshops, and arts related events. In addition to supporting local artists and performers, the JDCAC has developed a strong culture of collaboration, partnering with the Auburn Arts Association, Auburn Area Community Theatre, Auburn Community Orchestra, Jule Collins Smith Museum of Fine Art and other organizations by providing fundraising assistance, studio and meeting space, exhibition opportunities, technical support and publicity. To inspire and enrich our community by offering exceptional classes, performances, visual arts exhibits and special events. The JDCAC meets its mission by presenting programs in visual, literary and performing arts in the Auburn area. Explore to find out more! 15th Annual Auburn CityFest Juried Art Show and Preview Reception | Thursday, April 25 from 5:30 - 7:30 p.m. | FREE and open to the public | To enter, download an application at auburncityfest.com. AACT Presents The Last Round-Up of the Guacamole Queens | May 10, 11, 16, 17 & 18 at 7 p.m. | May 12 & 19 at 2 p.m. | JDCAC | Buy tickets at auburnact.org. 10th Annual Day in Clay | Saturday, June 22 from 1 - 4 p.m. | Dean Road Ceramics Studio | One day open house where participants can tour the studio and create a clay project | Clay projects taught at 1, 2 and 3 p.m. and you must pre-register at the Harris and reserve a spot | $10 per participant | For more info., call 334.501.2944. AACT Presents AACT - OUT! | July 25 at 6 p.m. | JDCAC | FREE to open to the public | auburnact.org. AACT Presents Summer Shorts Showcase! | August 15, 16 & 17 at 7 p.m. | August 18 at 2 p.m. | JDCAC | Buy tickets at auburnact.org. AACT Announces Open Auditions for their Fall Jr. Performers Show, Chitty Chitty Bang Bang, Jr. | August 12 & 13 from 3 - 6 p.m. | Callbacks, August 15 from 3 - 7 p.m. | JDCAC | For more info., email Melanie Brown at supersugarmel@gmail.com. AACT Jr. Performers Present Chitty Chitty Bang Bang, Jr. | October 3, 4, 5, 7, 10 & 11 at 6:30 p.m. | October 5 & 12 at 4 p.m. | JDCAC | Buy tickets at auburnact.org.